Two new studies on the controversial video tapes from the El Bosque case in Chile have just been released. Richard Haines, chief scientist for the National Aviation Reporting Center on Anomalous Phenomena (NARCAP) and Bruce Maccabee, retired Navy physicist, performed independent, meticulous analyses of the tapes. For necessary background on this case, please see my previous articles: March 2012 with Ralph Blumenthal, and April 2012. I will not be repeating information here from these two posts but will assume everyone has read them. Last June, I went to Santiago partly to seek further resolution on this case. General Ricardo Bermúdez, Director of the CEFAA, told me that the objects did not appear to be bugs, "but we can't be 100 percent sure; it's still under investigation." During my second visit to the CEFAA office in September, the general informed me that the case is now being put to rest, but it remains unsolved. Haines and Maccabee worked with the two best videos for their studies. I learned during my first meeting with CEFAA staff that due to circumstances beyond their control, the other five videos are no longer in the CEFAA's possession. Therefore I was not able to view them nor can they be made available to others, as the CEFAA would have preferred. However, the two tapes which have been analyzed are by far the clearest tapes; the others were on cell phones and of poor quality. It is both intriguing and puzzling that the two scientists disagreed about the most crucial question in this case: Did the same unidentified aerial phenomenon, or UAP, appear on two separate cameras? If the exact same UAP was filmed by the two cameras 20 to 30 feet apart simultaneously, then we would know the object was large, distant and not a bug. Haines concluded that the two cameras captured the same UAP in one sequence, while Maccabee concluded they did not. "This investigation was carried out with the hope that at least two videos would provide image data that would allow for a triangulation and subsequent calculation of distance and size," Maccabee states in "Analysis of 'UAP' Images in two Videos Obtained During the El Bosque Air Show of November 5, 2010." Triangulation requires that the same object be filmed at the same time by observers at separate locations; without this, the distance to the object cannot be estimated and therefore its actual size cannot be determined. "Unfortunately, the two most promising videos did not show the same object at the same time from two locations," Maccabee concludes. He analyzed only the UAP images that appeared during the Halcones fly by, the first planes to take off during the event at the Air Force base. These included footage of the approach of the Halcones, and their departure into the distance, which is where Haines discovered a "temporal coincidence" (the same UAP in two videos at the same time) and Maccabee determined that the images were different. "My analysis does not preclude the possibility that there might have been a temporal coincidence at some other time but I am unaware of such a coincidence," he says. Maccabee's sometimes technical report includes section headings such as "Relative sizes and distances of the UFO if there were no motion blur," "Apparent motion of the object," and "Estimate of the distance traveled during the time between frames." His analysis of frames from one section includes calculations of possible distance-size-speed relationships "ranging from insect size and speed to "saucer" size and (great) speed." He points out that some of the dark on the bottom of the two best images of the object may be due to the camera's electronics reacting to the presence of a bright top portion. "Video cameras often create a dark 'reaction' to a very bright, small object in the field of view," he explained in an email. Maccabee concludes that the objects are not anomalies. "Without further information that would show the objects were distant and hence large, it must be considered most likely that the objects were small and nearby such as insects." In a recent email he explained that "Since I could not accomplish a triangulation of any of the objects I analyzed, I have to accept the scientifically conservative conclusion that the objects I studied could have been small and nearby." Haines takes a different position, as shown in his 108 page report titled "The El Bosque Video Case: A Preliminary Study of Anomalous Objects in Active Airspace." His analyses consisted of plotting the trajectories of as many different UAP as he could find as well as enlarging and enhancing the UAP images from selected frames. "That at least one of these UAP was not a flying insect near the cameras is supported by analysis of video images of the same UAP recorded by two separated cameras," he writes. And further, he explains that "the relatively short 'flight' durations, high angular velocities and high-speed changes in direction and small angular size of the UAP, recorded during seven of the ten airplane formation fly-overs, help explain why no one saw them at the time; these characteristics would appear to qualify these UAP as anomalous; they cannot be explained in prosaic terms." Haines states that "NARCAP's interest in this case lay mainly in aviation safety" and it is for this reason that he conducted the study. He suggests that these UAP could have presented a risk to flight operations, but acknowledges that without knowing for sure whether they possessed finite mass it is not possible to say. Many provocative questions are posed at the end of his paper: Why were there more UAP appearances associated with the fly-overs of certain types of airplanes than others? What are their energistic characteristics? What mechanism(s) guided their movements? What caused their changes in shape within very short periods of time? The contradictory element of these two new studies, and the questions they raise about the nature of the UAP depicted in the videos, adds to the increasing complexity of this case. This material has proven itself worthy of scientific scrutiny, initially in Chile and now in the United States, and as been given a great deal of attention. 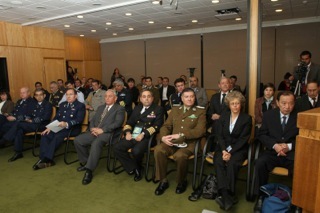 And how encouraging it is to see high-ranking military officers, scientists and aeronautic specialists in Chile recognizing the existence of the "UFO phenomenon" and taking it seriously! I have observed this firsthand and talked to many of these officials in person. It is in the well-established tradition of science that research results differ sometimes, and debate follows. The issues usually get ironed out over time - although with this case, that may not happen. The controversy surrounding this case has centered around whether the object(s) could simply be bugs. 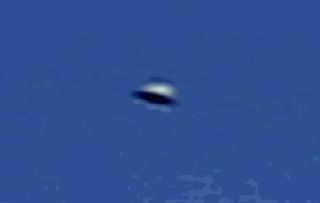 It seems that if they are not some kind of anomaly, or "UFO," they are likely bugs. There are not many other realistic alternatives. Maccabee has deduced that these objects most likely are bugs. "Lacking conclusive proof that a flying insect could not make an image such as recorded on the video, one may conclude that the 'anomalous phenomena' images were, in fact, images of insects," he writes. Others have put forward the same position on various internet blogs. As I mentioned in my previous article, entomologists in the U.S. with knowledge of Chilean insects stated fairly uniformly that it is impossible to determine whether the objects were bugs; there was nothing in particular that would lead them to conclude that they were. Most thought it was unlikely. While in Chile, I talked to two independent scientists who believed the object(s) may be insects, but who also said we can't know for sure. And of course, none of them were photo experts. I was curious: If indeed this were a bug, which species would it most likely be? 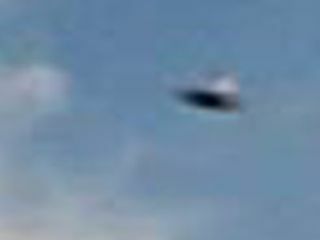 Perhaps by observing the candidate in flight, we could see if it resembled the objects in question, particularly the two still images that show a consistent shape in two different parts of one video. This would not be a "scientific" process...but it could be interesting. Last month, the CEFAA contacted Mario Elgueta, a leading Chilean entomologist with over 30 years of experience and Chief of the Entomology Department of the National Museum of Natural History in Santiago. When first looking at the images, Elgueta said "there is no noticeable detail in them to make me think on an insect right away" and that the images were too distorted for him to be of help. With the assistance of the CEFAA, I followed up and asked him: If this were a bug, which species would it most likely be? After consulting with his colleague Fresia Rojas, Elgueta said that "by the rounded shape and convex back" the images suggest a species of Coleoptera from the Coccinellidae family. "Several of these species are frequent in spring [when the videos were taken] appearing even in very populated areas.," he replied. This family consists of the small dome-shaped beetles we call "ladybugs." In his paper, Maccabee calculated various speeds of a potential bug in relationship to its distance from the camera. A ladybug is approximately a quarter of an inch, or smaller. "A quarter-inch sized insect could have been about two feet from the camera and traveling at about 12 mph," he told me in a recent email. When a ladybug flies, its tiny wings flap, while it separates it's otherwise convex shell into stationary wing sheathes and raises them up like two umbrellas that never come down. Thus, it's clear that the domed shape of this insect at rest is not sustained when in fight. In fact, it looks entirely different because of the way its shell is split and suspended up above. Here's what ladybugs look like when they fly. The clearest images of our dome-shaped UAP in the El Bosque videos show no such wing sheathes. Would the sheathes show up in a video of this bug two feet from the camera moving at 12 mph? Perhaps the tiny wings would be moving too quickly to show up...but the sheathes do not move at all. Should they be visible? 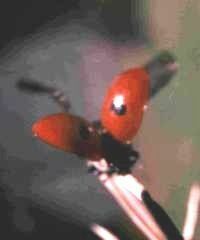 Furthermore, if you look at the body of the ladybug in flight, it looks elliptical and rather soft, since it has no shell covering it. It doesn't look much like the dome-shaped bug that we see sitting on a leaf or crawling. 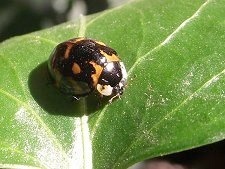 Could this be a quarter-inch ladybug, flying two feet from the camera at 12 mph? I sent Elgueta the links to some videos of ladybugs in flight, and asked him to comment on the fact that the flying bug does not look like the domed "thing" in our video. First he reiterated that it is impossible to say if they are bugs or not. "We estimate that no experienced entomologist regardless of what country can give a definite answer about these images." Regarding specifically the videos of the flying ladybugs, he made the astute observation that these videos, "made with short focus in centimeters scale, cannot be compared with others made in a different scale. Perhaps, you can make new technical studies with videos that can be equivalent concerning speed, focus, lighting and distance." Maybe this is the next step if anyone wants to continue this exploration. Haines makes some interesting observations as to why he believes at least some of the El Bosque objects are not bugs, even beyond his conclusion that the same UAP appears on two cameras 20 to 30 feet apart. He includes an image of an actual insect, dark and blurred, taken from one of the El Bosque videos. I recall quite a few bugs on this footage near the camera that looked like blurred, black blobs.) "Virtually all of the UAP images reviewed in this report were in sharper focus than was this alleged insect suggesting that they were all at a distance greater than the hyperfocal distances of these cameras!" Haines writes. On the question of whether all the UAP could have been insects, Haines states that "on balance, the answer is very likely no." He offers a host of reasons why: "Because of the linearity of their flight, their high angular velocity, their occasional spontaneous and unexpected appearance within a video frame, their apparent trajectories relative to the different airplane formations, their almost consistent oval shape and nearly horizontal orientation, their lack of any color other than gray and white and perhaps most importantly, for one UAP at least found in Figures 8 and 11, its relatively large distance from the two cameras." "Nevertheless," he concludes, "this hypothesis must be left unanswered at this time." And after all this, what is the final position of the CEFAA on this case? I received this official response to that question: "After hearing from the entomologists who have looked at the images, we at the CEFAA agree that these photos do not show anything which allows for the conclusion that they are bugs. But since we are unable to identify the objects in the videos, the case remains unsolved. We are posting on our web page diverse analysis and opinions on this case, to allow each interested person to draw his/her own conclusions." Along with the two new American reports, the CEFAA web page includes four Spanish studies which also provide conflicting results. Marcelo Moya, a Chilean photo analyst, affirms that "the object that caused a commotion because of its brightness would with a high probability correspond to the flight of an insect, the hypothesis being it is a fly or a botfly (the latter being a bigger size) that passed by the focus of the camera." However, Carlos González Sasso, a photo expert from the DGAC Air and Space Museum in Santiago, states that the image of the same object shows something metallic, "a defined geometry, not being an object of biological origin, with an inclination that suggests ascending forward movement, this being reinforced by a flash of clear light at the base." 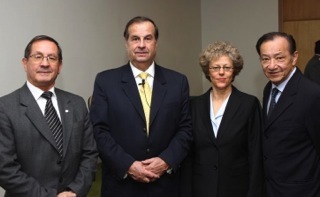 I commend the CEFAA for working so hard on this case with experts from many branches of the Chilean government, and for making whatever information they could available to these scientists. It's not clear what these videos show. At this point, each of us can form our own opinions about something that science cannot determine, or we can simply accept that we will likely never know.